A historic mockup of an Apollo F-1 engine was moved to Aerojet Rocketdyne's Los Angeles headquarters, Oct. 2, 2013. A mockup of a mighty moon engine took a short trip under moonlight Wednesday (Oct. 2), as it moved from its display of 35 years to a nearby outdoor pedestal in Los Angeles. The 19-foot-tall (5.8 meters) Apollo F-1 engineering model was partially disassembled and then trucked the 3.3 miles (5.3 km) from outside the Canoga Park factory where the massive engines were assembled in the 1960s to Aerojet Rocketdyne's facility in Chatsworth, Calif. The move preceded the company closing the plant by the end of the year. F-1 engines provided the thrust needed to launch NASA's 363-foot-tall (110-m) Saturn V rocket, which carried Apollo astronauts to the moon and lofted the United States' first space station, Skylab. Each first-stage cluster of five F-1 engines put out the energy equivalent to 85 Hoover dams. Rocketdyne, which at the time was part of North American Aviation (later Rockwell, Boeing, Pratt & Whitney and then since June of this year, Aerojet) produced a total of 98 F-1 engines, from which 65 were used to launch 13 Saturn V rockets between 1967 and 1973. The full-scale model on the move Wednesday, which was referred to as Engineering Mockup 1 (EM1), was originally located on Rocketdyne's Canoga Park plant floor, where it was a reference for engineers building the real engines. "It was used in the 1960s, back when configuration control was a little less formal," Lariviere explained. "They'd make a mockup to take dimensions and final measurements." In 1976, after the Apollo program ended and production of the F-1 was halted, Rockwell donated the EM1 mockup to the Smithsonian, which in turn loaned it back for display outside the Rocketdyne plant. It sat there undisturbed until earlier this week, when it was hoisted onto a truck for the move to Chatsworth. Once used as an engineering model, the F-1 engine mockup will represent the past and future at its new display outside Aerojet Rocketdyne's Los Angeles headquarters. 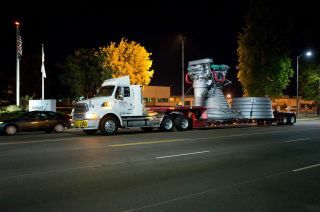 Riding on a flatbed, the "oversize load" F-1 engine rode up Victory to De Soto Avenue, then turned up De Soto, where it arrived at the Aerojet Rocketdyne facility at the corner of Nordhoff Boulevard. Today, it was offloaded from the truck and mounted onto its new pedestal. The F-1 "monument" will now serve as inspiration for the Aerojet Rocketdyne engineers working to design and build an upgraded, affordable version of the engine, which could be used for NASA's next-generation heavy-lift rocket, the Space Launch System (SLS). In its advanced 130-metric-ton configuration, the SLS will be the most powerful rocket ever built, able to support any destination, payload and mission, according to NASA. The space agency is planning to use the SLS to launch crews to Mars by the 2030s. "We are looking at the F-1 engine as an upgrade today to provide a booster engine for the SLS advanced booster configuration and looking toward furthering NASA's human space exploration," Lariviere said. Click through to collectSPACE.com to see a time lapse video of the F-1 engine mockup on the move to Aerojet Rocketdyne’s Los Angeles headquarters.